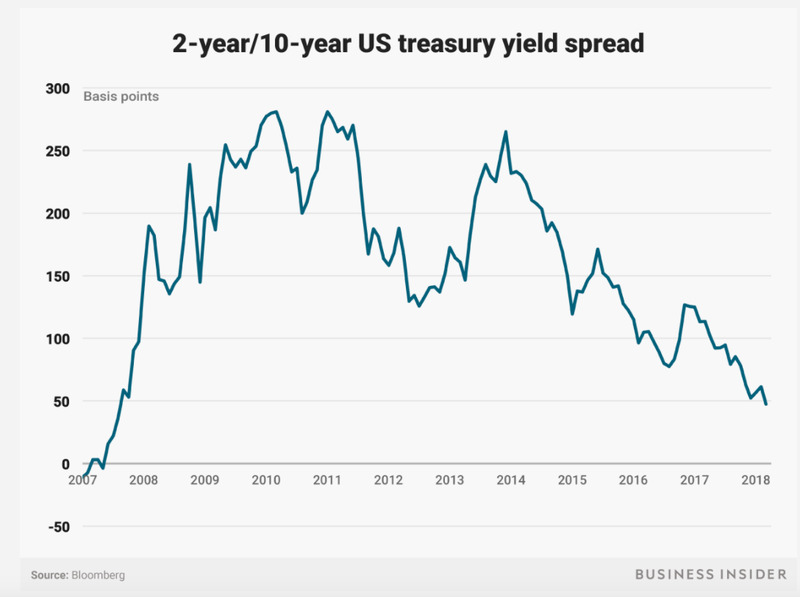 The yield curve, which measures the difference between short- and long-term bond yields, hit its narrowest point since October 2007. When the curve inverts, meaning long-term yields fall below short-term yields, it has historically indicated that a recession is coming. Follow 2-year and 10-year Treasury yields here. What’s happening in the bond market is raising recession fears. The 2-year/10-year spread, which measures the difference between short- and long-term bond yields, fell to 47 basis points as of Thursday afternoon. 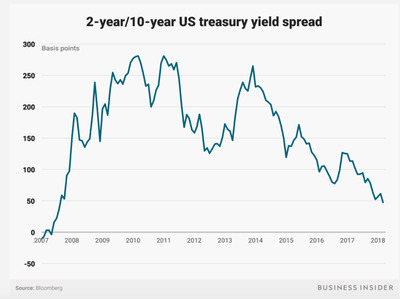 That’s the narrowest spread since October 2007, a few months before the Great Recession. A flattening yield curve happens when the difference between short- and long-term bond yields narrows. Right now, that’s because long-term yields are falling and short-term yields are climbing. The benchmark 10-year Treasury yield dropped this week to a six-month low, about 2.75%. Meanwhile the 2-year yield has been on the rise in anticipation of more Fed rate hikes. The yield hit nearly 2.30% earlier this month, a level not seen since 2008. This matters because the curve is approaching inversion, a key recession indicator. The yield curve is considered inverted when short-term yields are trading higher than long-term yields, meaning investors expect returns to depreciate in the long run. And historically, that phenomenon doesn’t play out well. 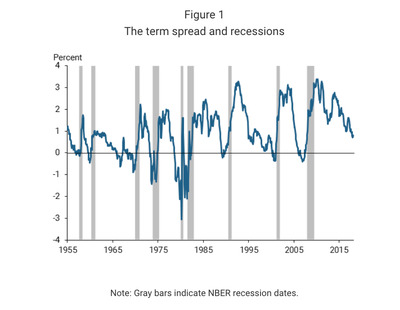 An inverted yield curve has preceded every recession in the past 60 years. Others are saying it’s important to not get too caught up on the narrowing 2-10-year spread. “The challenge for equity investors during the balance of this recovery is remaining appropriately attentive to the yield curve as it nears inversion but remembering the stock market often does well with a positively-sloped yield curve, even if flattening,” Leuthold Group chief investment strategist Jim Paulsen told the Financial Times. There isn’t a consensus among officials at the Federal Reserve about what the flattening yield curve means. Fed Chair Jerome Powell said at a press conference last week that it doesn’t necessarily mean a recession is on deck. Other central bank leaders, including Cleveland Federal Reserve President Loretta Mester, have echoed that sentiment. Meanwhile, others see an inverted curve as reason to hit the panic button. 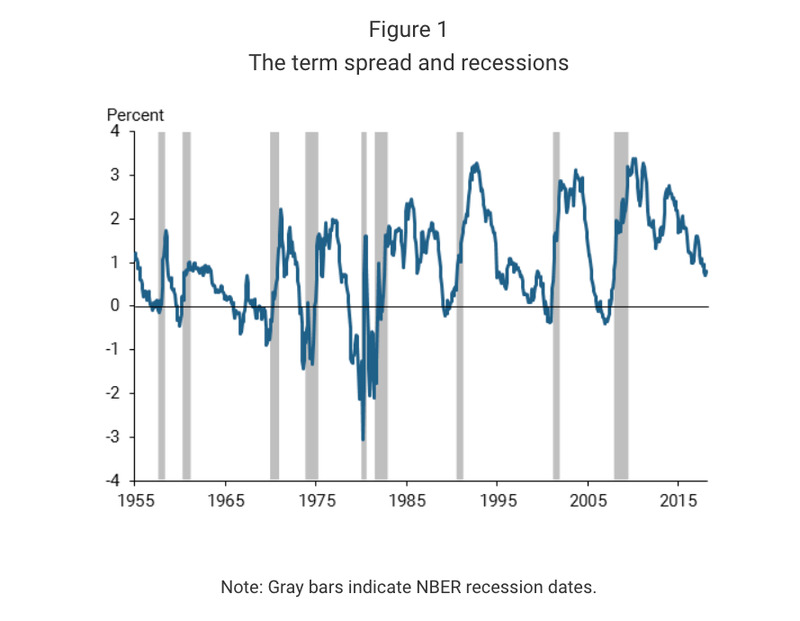 “The term spread-the difference between long-term and short-term interest rates-is a strikingly accurate predictor of future economic activity,” Federal Reserve of San Francisco economists Michael Bauer and Thomas Mertens wrote in a note earlier this month. An inverted curve “reliably predicts low future output growth and indicates a high probability of recession,” Bauer and Mertens added.